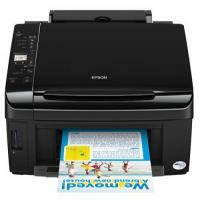 Epson SX215 is an affordable yet feature-rich all-in-one printer. Along with its basic functions (printing, scanning, and copying), the printer is also capable of providing direct printing. The printer has a colour LCD display and card reader that lets you directly print from memory cards. Epson SX215 weighs 5.9kg and measures 450 X 348 X 182mm. It has a flatbed scanner and 1.5-inch colour display along side of the four-in-one memory card reader. The large LCD display lets you scroll down, select and print images directly from memory card. The printer has one input paper tray with 120-sheet capacity (at the rear side of the printer) and one output tray at the front of the printer. The printer uses high-quality Epson Stylus SX215 ink cartridges and has an easy-to-use interface. The Epson Stylus SX215 is a low-cost all-in-one printer with many attractive features. Unlike its many other low-cost competitors, the Epson SX215 offers a good deal of features. It offers direct printing from memory cards and USB connectivity. The printer produces high-quality prints at a decent speed which makes it a great choice for home users. However, the professional photographers and office users might not get attract to this model. It does not have any ADF, fax, or automatic duplex. Epson T0715 multipack; 4 colours. These cartridges are also available in T0715 multipack (Epson Expression SX215 multipack) that lasts longer and offers you great saving on ink expenses. How to fix printing issues with EPSON SX215 printer? Printing problems can cause by a number of factors. However, two of the major causes are; empty or dried out EPSON SX215 ink cartridge and/or a blocked print head. If you find that the printout is unexpectedly fade, then it may be possible that the printhead of the printer is blocked and its nozzles are not delivering the ink properly onto the papers. To resolve this issue, you can use Head Cleaning Utility in the printer driver’s setting. Run the Clean Printhead command and let the printer proceed. Once the process is completed, make a test print on the paper you inserted earlier. If the print quality is not satisfying, run the head cleaning process again. If still the print quality does not improve, we would recommend you to contact Epson support. Q. What does the message “Ink Cartridges is not recognised” indicates? How can I resolve the error message for my EPSON printer? The printer includes a faulty or outdated chip. Ink on the printer contacts or due to some hardware fault with the printer. Ensure that the cartridge chip is clean and clear, free of ink smears or debris. Ensure that the printer’s contact pin is free from dust. Make sure that the EPSON SX215 ink cartridges you have installed are seated well in the printer tightly and securely. Replace the installed ink cartridges with the new ones. Q. I’ve recently purchased compatible EPSON SX215 ink cartridges from Printerinkcartridges.ie . Those cartridges produced as good results as the original ones. I would to like to add review for these ink cartridges. Is that possible? A. Yes, definitely. Thank you for making the purchase with us. You can rate any of the product purchased from our site. To rate the product or add your review for the purchase made, select the ink cartridges you’ve bought from our site. You can see an option of “Add Review” given on the page. Proceeding to this option, you can write your own experience, which will help others making the correct choice. Q. Does the printer support fax function? A. No, the printer does not support fax function. Q. Are the replacement cartridges of EPSON SX215 printer available in T0715 multipack? A. Yes, those cartridges are available in T0715 multipack also. Q. Are compatible EPSON SX215 ink cartridges easy to install? A. Yes, installing these Epson ink cartridges is easy. Please follow the instructions provided in the user manual for assistance. Q. After installing compatible EPSON SX215 ink cartridges, sometimes I get a message on the screen that the cartridges are not genuine. There’s been no problem so far as I’ve been ignoring these warnings but I’m worried for how long I can go like this and what if any problem occur in near future? A. You need not worry at all but just continue with your printing job by ignoring such type of warnings. At the same time, be very careful and ensure you don’t accept any terms and conditions or updates that may be displayed without reading them cautiously. Q. We use a large number of compatible EPSON SX215 ink cartridges in the office. If we purchase them from you, you will be able to send them in a day in case of urgency? Our current seller doesn’t deliver fast so we’re looking for an alternative. A. We offer 1-3 day delivery services to several customers who are happy with the speed and efficiency of the products from our end. You need to place your order before 12.00 noon so we can commence with the delivery procedure. If the requisite cartridge is in stock, your location isn’t in a remote area and there are no transportation hitches, we assure you that you’ll get your cartridges the next day. Q. If I buy compatible ink cartridges (EPSON SX215 ink cartridges) which are working fine but need to return them for some reason, will you accept them and give a refund? How do you go about it? A. If you do not want to use the ink cartridges (unused and unopened, in original packaging like before) that you purchased from us, you need to intimate us within 30 days of purchase. We will exchange them or provide a refund and give a credit to you on your account. Q. Do you sell black cartridges in singles for the Epson SX215 printer? A. Yes, the single black Epson T0711 ink cartridge is available as per the requirement for the Epson Stylus SX215 printer. Q. Could you please tell me if the chip in your compatible Epson SX215 ink cartridges will work on this printer? A. Yes, our compatible Epson SX215 ink cartridges (listed on the page) are fitted with the correct chip so you can easily install them into your Epson SX215 printer without any issue. Q. The printouts generated by Epson SX215 printer are missing colour and/or black print. What can I do to solve this problem? Ensure that your printer software is not set to use black ink only. The Epson SX215 ink cartridges may be old or low on ink. So you may need to replace them. Try to turn off Photo Enhance mode. Your printed colours can never exactly match your on-screen colours. However, by using the ColorSync (Macintosh) or ICM (Windows) setting, you can use a colour management system to get as close as possible. Q. Does the Epson SX215 printer works with windows 8 ? A. Yes, the printer works well with Epson SX215 printer. Q. The printout contains horizontal banding. How to remove this? A. Firstly you need to check that the Print head is performing to its optimum. You can follow the steps as described below to resolve this problem. Check whether the Nozzle Check is correct and make sure you have selected the correct media setting in the driver. Click Start to access the properties of the driver. Then go to Settings and select Printers. Now, right-click on the icon and then select Properties. Ensure that Genuine EPSON media is being used and match it to the correct choice in the driver. After this, check that the media is printable side up. Make sure that you are using the printer's full potential by choosing the highest print quality. Simply slide the Print Quality bar to Quality. To check whether the ink levels are low, use the Status Monitor Utility. If the cartridges are low or have been installed for a period longer than six months, then you may need to replace them. Q. What are the colours available in EPSON SX215 ink cartridges? A. The EPSON SX215 ink cartridges basically come in four different colours namely black, cyan, magenta and yellow. Q. I am a cyber cafe owner and use EPSON SX215 for printing. The daily usage of the printer is heavy and thus I was looking for compatible multipacks. Please recommend me the same. Q. The Efficiency of my printer has deteriorated since a week. Is there a problem with the ink or the printer? A. This issue can signify many things which not always signifies exhaustion of ink. There might be a blocked printhead as well. Try performing printhead cleaning procedure with your printer first to ensure that there is no clogged printhead. For cleaning the blocked head consult the user manual. If the problem still persists then change the cartridges. If the problem still persists feel free to call customer support services on +44(0)28 308 33221 or drop a mail to us at info@printerinkcartridges.ie. Q.What is the capacity of EPSON SX215 ink cartridges? A. The compatible EPSON SX215 cartridges come in a pack of 13mL ink while the original Epson ink cartridges have a capacity of 7.4mL for black and 5.5mL for magenta, cyan and yellow colours. Q. I live in Waterford and wanted to order cyan EPSON SX215 ink cartridge. Is there a delivery service in Waterford and if yes, then what is the expected time duration? A. We deliver all over in Ireland. Your order will be delivered in 24 hours. Approximately 90% of our orders received before 12 noon daily are despatched same day and delivered on a next-day basis with Fastway Couriers. The delivery time may vary according to the courier rush, but generally, the delivery is satisfactory. Q.How to ensure that the EPSON SX215 ink cartridge I have ordered is genuine? A. The original EPSON SX215 cartridge comes in a brand new and unopened packaging from the Original Equipment Manufacturer. You can find the original HP logo mark next to the product image. We assure you that all the products on our website listed as "Original" are absolutely genuine and are supplied from the Original Equipment Manufacturer only. Q. I have brought Compatible Epson T0713 ink cartridge. With which printers is it compatible with? Q. I have an Epson SX215 printer at home. We use it regularly for printing and its ink gets easily exhausted. Buying an Epson cartridge, again and again is a costly deal. Please recommend me which cartridge to buy to manage bulk printing. For any further assistance about the same feel free to call customer support services on +44(0)28 308 33221 or drop a mail to us at info@printerinkcartridges.ie.